Hikers in Stanley Park are benefiting from the trail mapping efforts of Chelsey Pousland ’17, a recent graduate of the University’s Geography and Regional Planning Program, known as GARP. 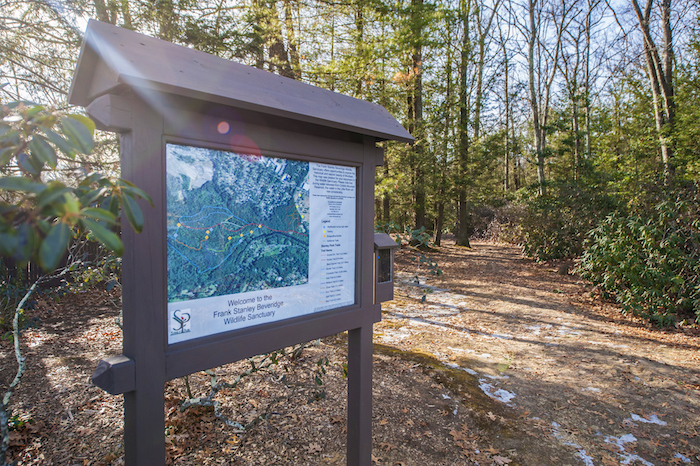 Thanks to her efforts, the trails in the park’s Frank Stanley Beveridge Wildlife Sanctuary have been accurately mapped, with signs at points of entry and trail maps placed in kiosks throughout the several miles of trails, encompassing some 100 acres of the 200-acre sanctuary property. According to Pousland, due to the former lack of signage, hikers lost in the sanctuary often made cell phone calls to park rangers for assistance. Stanley Park officials reached out to Westfield State’s GARP program for help in 2016, and Pousland accepted an open invitation made by Professor Tim LeDoux to work on the project as a three-credit independent study. With supervision from LeDoux, Pousland promoted the project in October 2016 at the park’s annual fundraiser, Run Stanley 5K, and donations were used to help fund the trail mapping project and to repair bridges along the trails that had been damaged by storms. Using a Trimble GPS unit, Pousland collected data points as she walked each trail. She then used specialized Geographic Information Systems (GIS) software to create the map, which was made available online in the summer of 2017. Three signs displaying a map of the trails were placed on the outskirts of the trail system, two at trailheads and one at the deepest point within, and the printed trail maps were placed in kiosks, completing the first phase of a three-part project. For the second phase, Pousland used the Trimble GPS to create a plan for the placement of 52 trail markers at each intersection throughout the sanctuary. Each marker indicates latitude and longitude and trail directions. Stanley Park hired the Appalachian Mountain Club to create the trail marker signs, which were crafted from wood last winter and are being placed this spring. Each numbered marker provides a geographic reference point, so if hikers need assistance, they can provide the trail marker number to indicate their precise location when they call Stanley Park rangers. For the third phase, still in the planning stage, Pousland suggested creating a bar code to be added to the map, so hikers can scan it and use their smart phone in the sanctuary. “It has been a pleasure to collaborate with Westfield State and its talented students,” says Delmastro. Pousland is proud to have contributed to an impactful local project and glad that she took advantage of another hands-on learning opportunity. “I completed three internships and landed a full-time position by the end of my college experience,” she says. 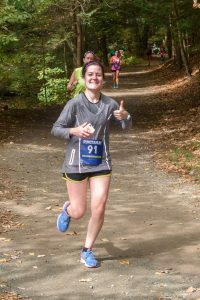 Pousland returned to Westfield in October 2017 and participated in the Run Stanley 5K, where she was able to enjoy the fruits of her labor, as the 5K route includes the border of the sanctuary trail system. Currently a transportation planning assistant at the Central Massachusetts Regional Planning Commission, she assists the transit planning staff on a variety of data collection, service planning, and other transit-related tasks that support the Worcester Regional Transit Authority. “I love my job and enjoy learning something new every day,” she says.